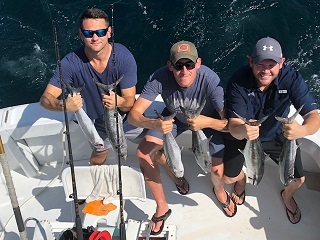 Mark Padgett, Chase Harris and Kyle Maese from the northeast chartered the Top Shot Sportfishing charter boat team to do some deep sea charter boat sport fishing in Fort Lauderdale, FL. These guys were part of a convention taking place in Fort Lauderdale. After boarding the boat, the anglers said their objective was to have a good time and catch any type of fish. Fifteen to twenty minutes after leaving the dock, lines were in 120 ft. of water at the sea buoy in Fort Lauderdale, 1.8 miles from shore. We started trolling with two #8 plainers, one with a 3 � blue reflector drone spoon, and the other with a blue sea witch in front of a double hook Bonito strip. For surface baits we went with two Ballyhoos and two Bonito strips. We trolled the reefs to the north of Fort Lauderdale and ran across a very heaving weed situation � not fishable. So we headed south of Fort Lauderdale towards some of our 34 artificial wrecks (including one Texaco oil rig) located in Fort Lauderdale sitting in 80 ft. of water out to 520 ft. of water. The three anglers took turns bringing in their fish, taking pictures of their actions and enjoying their trip. With a total of 9 Kingfish, 2 Barracudas and 1 Bonito, it was now time to head back to the dock. The anglers retired into the a/c salon and enjoyed the relaxing trip back to the dock at Bahia Bar Yachting Center, 801 Seabreeze Blvd. Fort Lauderdale 33316.